"This recipe combines two of our favorite meals, TACOS & PIZZA!!" Preheat oven to 400 degrees. In a large skillet over medium heat, cook ground beef, drain off excess grease, add taco seasoning and prepare as directed on the package. 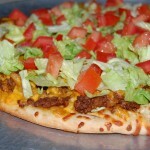 Spread taco meat evenly over pizza crust. Sprinkle with cheese. Bake 8 to 10 min. or until crust is golden brown and cheese is melted. 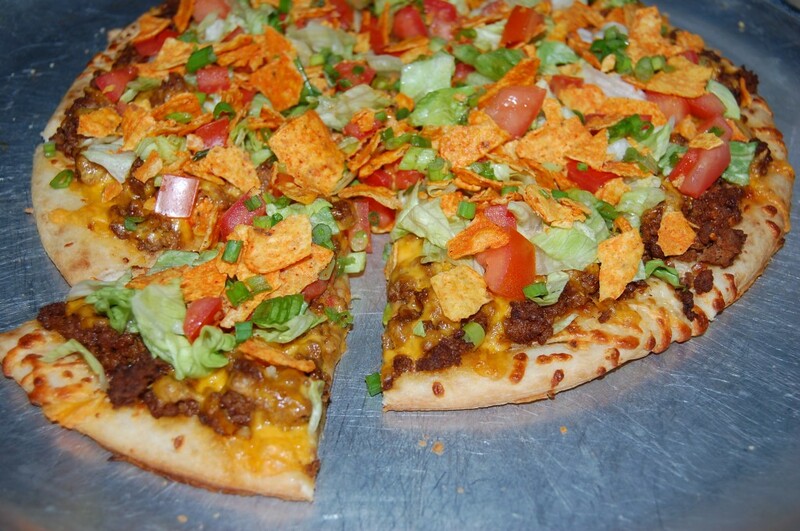 Top with lettuce and tomatoes, then sprinkle crushed Doritos or taco shells over pizza. Drizzle with salsa. Cut into 12 slices. Cook's Note: Taco Supreme Pizza - Top with sliced green onion and sliced black olives just before serving. You can also spread a layer of refried beans over the crust before adding ground beef mixture or try spreading a layer of nacho cheese sauce in place of shredded cheese.